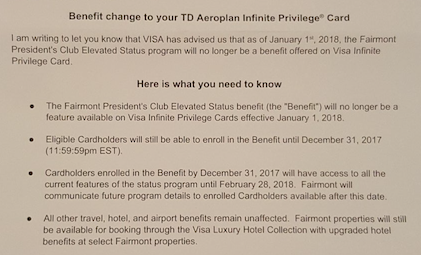 Rewards Canada reader and Meet the Collector Charles T. forwarded to us a letter from TD letting him know that the Fairmont President's Club Elevated Status benefit that comes with his TD Aeroplan Visa Infinite Privilege card will be discontinued. This means cards issued by TD, CIBC and RBC are all affected by this change. Unfortunate to see another benefit being taken away from what are the highest end Visa cards in the Canadian market but there may other factors in play here. As you may or may not be aware of, Fairmont Hotels was bought out by French based Accor Hotels. Accor has their own loyalty program called Le Club AccorHotels and recently the moves on their part seem to be indicating the near end of Fairmont's President's Club program. If this is really the case it could explain why this benefit is being removed from the Visa Infinite Privilege program. A further confirmation of this would be if the benefit is pulled from The Platinum Card from American Express - which it hasn't been, yet.